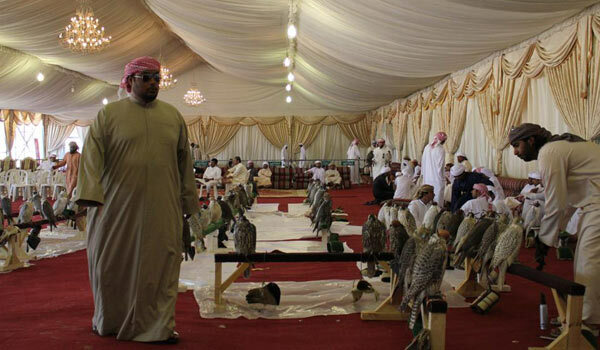 Every year there is a competition held in Dubai for falconers from all walks of life to enter, the event is basically a speed trial with the top 10 fastest falcons from each category receiving a prize. 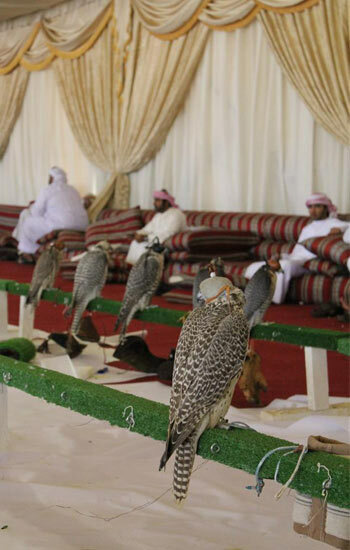 This event is only possible with the generous support and sponsorship of Sheikh Hamdan Bin Mohamed Bin Rashid Al Maktoum, (Crown Prince of Dubai) Sheikh Hamdan is an enthusiastic falconer and helps to keep falconry alive in Dubai. The competition is open for anyone to enter and free of charge, running for 5 days of preliminary rounds and a one day final where the 10 fastest from each category compete for the best prizes. We arrived in Dubai late on Friday night and went straight to our hotel, the competition was due to commence on Monday so we had time to look around Dubai before the start. 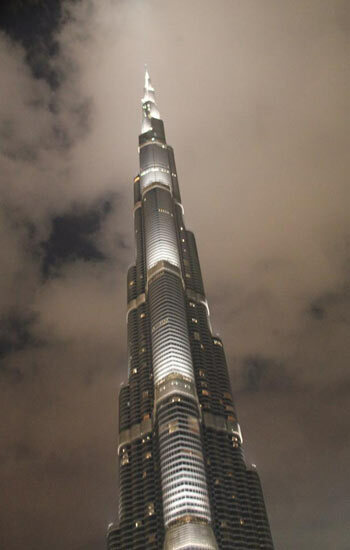 As usual the welcome and hospitality of our friends in the UAE was superb, the people are extremely welcoming and friendly, and not happy unless they are feeding you enormous amounts of food. Monday arrived and we set off to the desert for the 1st day of the competition, this was open to pure Saker falcons from the wild only. 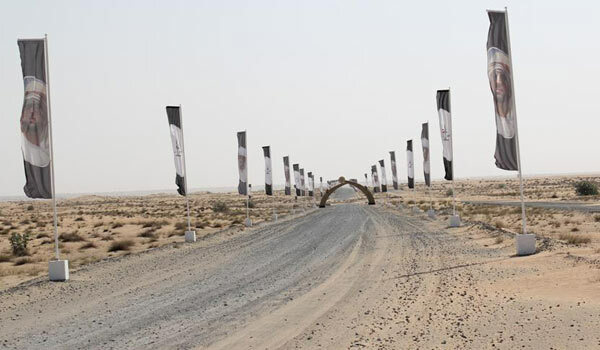 After a 30 minute drive to the outskirts of Dubai city our 4 x 4 moved from a 6 lane motorway and on to a rough track heading out in to the desert, the way was clearly marked by a double row of tall flag poles each carrying a photo of Sheikh Hamdan every few yards for as far as you could see. 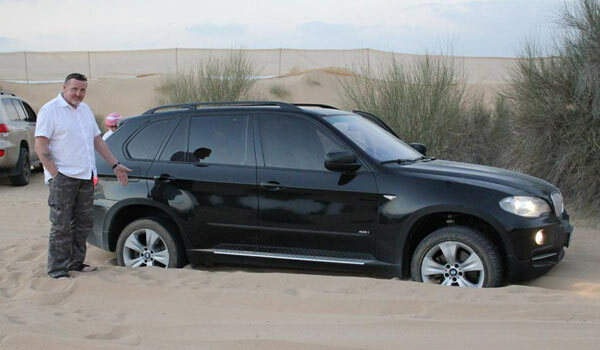 At the end of the rough track, about a half mile of soft sand waits for the unwary for the last leg of the journey to the competition site, the locals mostly take this in their stride but even some of them ended up stuck up to the axles and unable to move. Once parked on a reasonably firm piece of desert in hope of an easy start on leaving, we entered a huge white marquee complete with chandleries, carpeted interior and hot buffet lunch for all attendees. All entrants register their presence and their falcons ring number/chip number is logged, once all is ready, a computer program shuffles the competitors details and sets them in a random order. The running list is posted in one corner of the marquee and all crowd around eager to see their position, on breezy day’s position and time of flight can have a great effect on the falcons time. The falcons are taken to the release point one after another in quick succession, no sooner than one falcon reaches the end point and is lifted from the lure than the next is un-hooded and readied to go. A semi circular blind is constructed as a release area, the hope is that falcons will not be distracted by any outside influence inside this shielded cove. 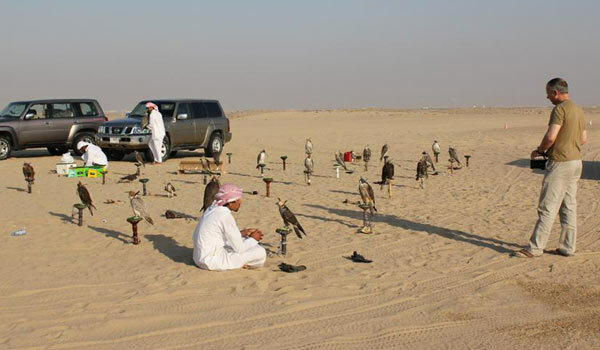 Once in place the falconer gives a signal of his readiness, another falconer begins to swing a lure vigorously and call loudly a measured 400 meters away across the sand. The falcon is un-hooded and great care is taken to try and ensure the falcon sees the luring, this does not always happen and some falcons leave the arm of their handler without noticing the swinging Hubara wing in the distance, many quickly spot the lure once on the wing but often precious seconds are lost. Once in the air, the falcon passes through infrared beams that trigger the electronic timing device, the hope is that the falcon will fly as direct a line as possible to the lure in as quick a time as possible. The timer stops as the falcon breaks the corresponding beam at the far end of the course, the resulting time is immediately flashed up on screens inside the marquee were most spectators watch the action on a large screened TV. Video cameras are set up at strategic points along the falcon’s flight path, the pictures are re-laid to the TV screen giving spectators a superb view of the action, fast falcons making good times are greeted with approving applause from the crowd. Day 1 is for wild pure Saker falcons. Day 2 is for wild pure Peregrine falcons. Day 3 is for Gyr x Peregrine males. Days 4 is for Gyr x Peregrine females. Day 5 is for pure Gyr falcons and Gyr x Sakers. Males and females compete against each other except in the Gyr x Peregrine sections, due to the large number of these falcons it would not be possible to run them all through in one day. The numbers of falcons competing was between 80 and 130 on each day, these would be reduced to the 10 fastest falcons from each section for the final. All 50 finalists received a generous prize for their efforts, but the top 3 from each group take home a new car, well worth the effort. The atmosphere within the marquee is tense at times but always good humoured, entrants who perform well and make good times are admired and congratulated by all. The time difference between most top placed falcons is very small and only fractions of a second separate them in the running, this is where a certain amount of luck is sometimes needed, if your falcon fly’s at a time of little or no wind it can make the difference between a winning or losing time. 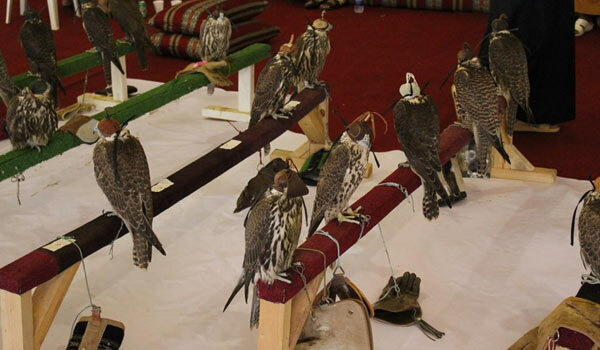 These competitions are now held in Abu Dhabi, Qatar, Kuwait and Dubai each season with great success, with some falconers training their hawks just for the competitions. 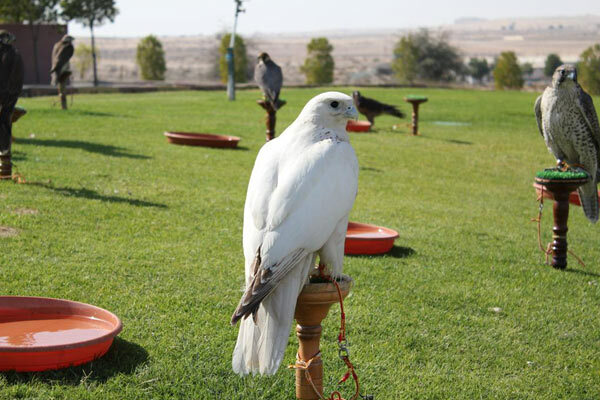 With hunting ground and opportunities to hunt wild quarry becoming increasingly difficult to find in the Gulf region, these competitions are helping to keep falconry alive for many Arab falconers. The competition was very interesting and certainly worth a visit, made even more so with the attendance of some of our own falcons, the whole event was superbly organised and run throughout. 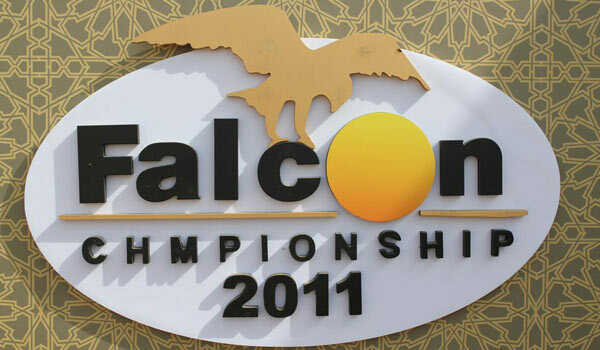 We will certainly be returning to see the racing falcons in Dubai.